My first workbench was a steel frame bench with chipboard top and shelves. It fit perfectly in the tiny shed I had to work out of, and worked well for small projects, like my boys’ pinewood derby cars. I still use it for storing tools. My second (and current bench) is a repurposed desk. A big improvement over the tool bench, it is a knock-down piece with a large surface. I’ve made some improvements, like adding a front vise and drilling dog holes. But after three or four years, the top is now sagging enough to be a problem. 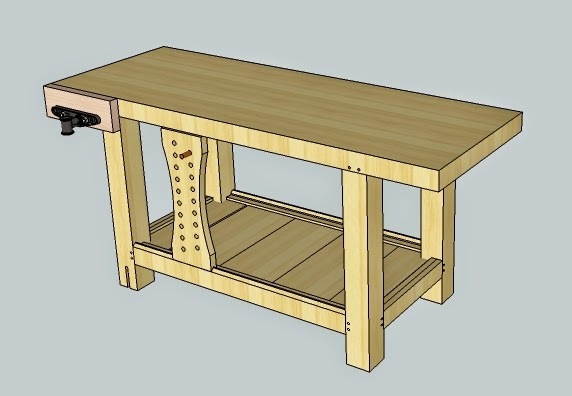 So, after looking at a bunch of workbench designs, and reading Workbenches by Christopher Schwarz, I decided on a Roubo design. My choice of materials is severely limited--there are only a couple of very small hardwood dealers in the area, and I just wasn’t going to spend the $$ to ship that much lumber from an online dealer. So, southern yellow pine from the home center. I had planned on buying the lumber and cutting it to rough size, then letting it dry out in the garage for three or four weeks. I had planned on starting the build in April. Last April. But, life happened, and the wood is still stacked in the garage drying. Of course, that means my wife’s car can’t get in the garage, which makes her rather unhappy. But, hopefully I will be able to start the build next month. I’ll keep you posted.